The first systematic reference on the topic with an emphasis on the characteristics and dimension of the reinforcement. This first of three volumes, authored by leading researchers in the field from academia, government, industry, as well as private research institutions around the globe, focuses on macro and micro composites. Clearly divided into three sections, the first offers an introduction to polymer composites, discussing the state of the art, new challenges, and opportunities of various polymer composite systems, as well as preparation and manufacturing techniques. The second part looks at macro systems, with an emphasis on fiber reinforced polymer composites, textile composites, and polymer hybrid composites. 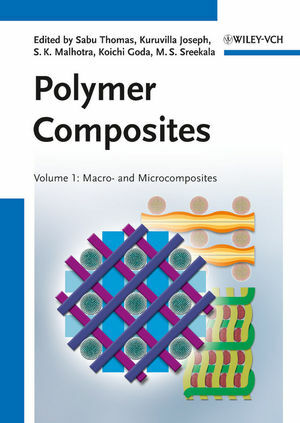 Likewise, the final section deals with micro systems, including micro particle reinforced polymer composites, the synthesis, surface modification and characterization of micro particulate fillers and flakes as well as filled polymer micro composites, plus applications and the recovery, recycling and life cycle analysis of synthetic polymeric composites.